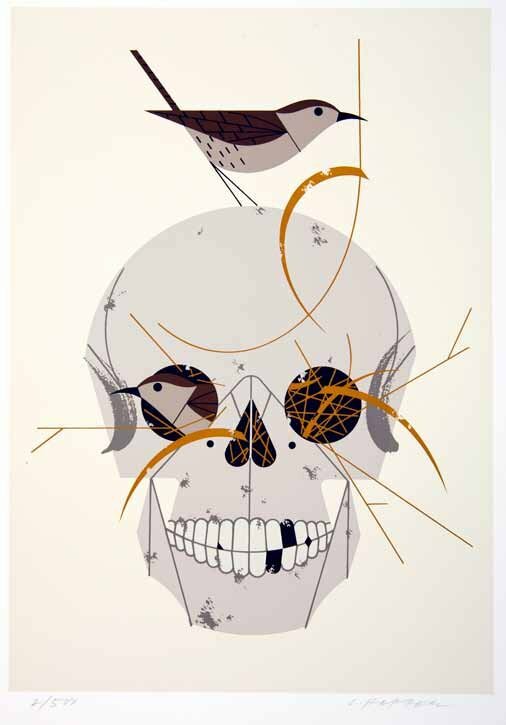 From charleyharperartstudio.com: Many people view the grinning skull as an unpleasant reminder of their mortality, but to house wrens an empty cranium is just another home-site with a domed ceiling. In 1888, a Kentucky doctor reported that a skull he had saved as a souvenir of medical school and hung on the back porch had been remodeled by wrens. It was still occupied in 1945 when his son moved the skull to his garage in Indiana, where it was promptly re-wrented. Home is where the heart is, even if it's a transplant.